The mere understanding of the world limo or a limousine becomes tantalizing for some people, as there are those who believe a limousine rental is that of a stretch limousine reserved for special events such as birthdays. The past few decades have given the ground transportation industry a facelift, putting airport limo services, limousine rentals and limo rental services on a whole new plane of existence. Stepping it up from a regular taxi service, the industry has introduced services that provided more luxurious and elegant transportation services such as a Toronto limo rental. 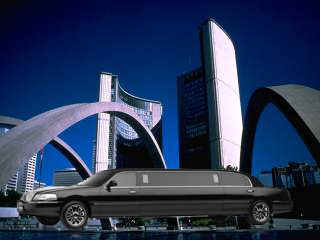 Toronto Airport Limousines has been operating such services in and around the city for many years. There are several reasons why the average citizen may be in need of a Toronto limo rental, whether entertaining a guest, welcoming a family member who is flying in, or welcoming a business associate coming into town. The limo rental service has become different in providing regular, but more luxurious, cars that are used for strict transportation and not for entertainment. You may only need a couple of hours, and it may be for a week. Either way, you can turn our drivers into a personal chauffeur or a corporate chauffeur. With the personal touch of these professionals, each vehicle will be designated appropriate to suit the needs of the client and anyone else using the service. If your guest is in town for a few days, and you are stuck at work without any time off, then a Toronto limo rental is the perfect solution for your problems. While you are at work, our Toronto Airport Limousines driver can conduct them around town to the shopping centres, markets and attractions. With the knowledge and experience of the city at their fingertips, our drivers become tour guides in their efforts to satisfy their clients to the fullest. We can accommodate personal requests, attend to corporate demands and meet the requirements of satisfaction and quality of service each and every time. When you are visiting Toronto, one of our goals is providing the best available in and around the GTA, from corporate limousines or personal car services, and our efforts are all part of the Toronto Airport Limousines commitment to satisfaction, quality and improvement. Consider a Toronto limo rentals, and make transportation around the city for a visitor much easier to manage and more enjoyable, with the glamour of getting in and out of a dedicated vehicle as they jump from one location to another during the day. This can be just the icing on the cake with getting a good impression, whether it is for a family member or a corporate figure.